Webs SEO Booster is the Small Business SEO tool of entreprenuers worldwide. Drive more traffic with less effort. Generate more leads. Get started today. SEO Booster is small business SEO software built with you in mind. We provide step-by-step instructions that show you where your site needs changes, help you make those changes, and track your progress so that your website is found by the people who matter most. 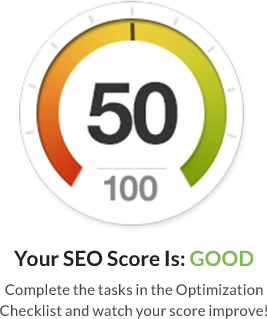 Included with SEO Booster is an integrated SEO grader that allows you to see the progress of your website optimization and calls out areas that could be improved. Webs SEO tool removes the confusion and technical barriers around search engine optimization and offers a simple interface that allows you to easily manage important parts of your website. Just point and click. This is your command center for all things SEO related to your website. 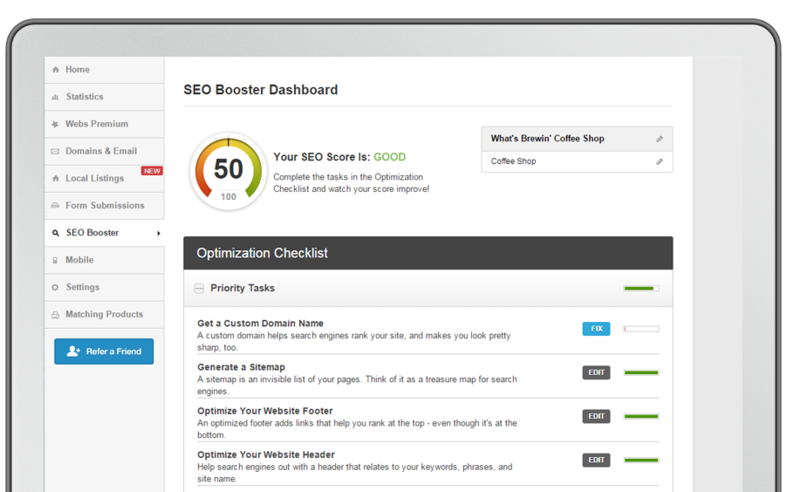 The built in SEO checker lets you see your optimization score and make improvements on the fly. Never worry about keeping track of your SEO tasks. Group items by priority or by page and check items off your list as you complete them. Complete tasks on your Optimization Checklist and watch your score improve in real time! Customize your messages in the areas that are most important, often-viewed, and leave a lasting impression on your visitors. Get your website found and ranked by submitting a table of contents, or sitemap, to search engines. Create a sitemap in less time than it takes to make a cup of coffee. Like writing captions in a photo album, optimize descriptions of your site's images so people can find your business through image or ecommerce product searches. Make tweaks to your websites' title and descriptions as often as you'd like, and then see how your site will look in Google search results. What Makes Webs Small Business SEO Tool Different? We have over 10 years of experience helping and hosting sites across the globe, which we used to create professional SEO tools specifically designed to help small business owners like you drive more visitors to their websites. This means you can spend more time doing what you love in your business - like developing new products and services or interacting with customers on social media. Purchase SEO Booster à la carte or sign up for a Premium account and put one of the best SEO tools to work for your small business website today. You're just four steps away from your own professional website.